Microsoft Corp. at the Macworld Expo in San Francisco this week is offering attendees a sneak preview of Microsoft Office 2008 for Mac. Well, part of it, at least. The Redmond, Wash-based software giant is previewing the next-generation of Word, its word processing and document creation software due as part of the combined suite sometime in the second half of this year. Microsoft said it chose to showcase Word during the conference because it's further along in its development cycle than the other Office components, and "because it's the Office application people use most." One of its highlights is a new user interface dubbed "Elements Gallery." It speeds up document creation by allowing users to drag-and-drop predefined templates for some of the most commonly used "Document Parts," such as headers, footers and tables of contents. Microsoft, which embraced the concept of clutter with its gazillion Office toolbar variations during the '90s, is taking a more level-headed approach with Office 2008 and has built the template interface directly into the document window. Other template libraries cover "Charts," "Tables," "Smart Art Graphics," and "Word Art." 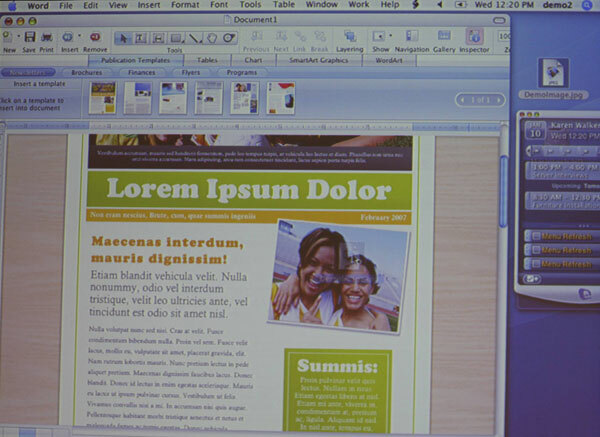 Additionally the new version of Word features a "Publishing Layout View" that lets users create incredibly layout-rich documents such as newsletters, fliers and brochures by uncovering desktop publishing layout tools and providing text box entry. During its presentation at Macworld, Microsoft also previewed My Day —a stand-alone widget-like application that allows users to track priorities and stay on top of daily activities no matter what application theyre currently working in. 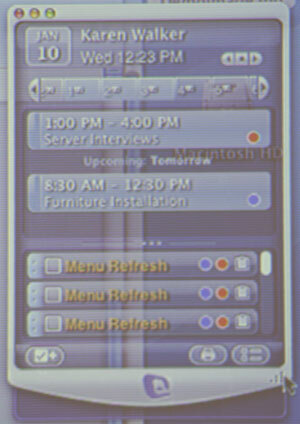 It interfaces directly with Entourage —another component of Microsoft Office —offering at-a-glance schedule and task viewing without having to launch Entourage. Though not on display at Macworld, a new version of Excel will add support for "Ledger Sheets," enabling anyone to use spreadsheet application to handle common financial management tasks. "Home and small-business users can balance checkbooks, track accounts or manage investment portfolios more easily than ever," Microsoft said in a statement earlier this week. Of course, the real push behind the new version of office will be its Universal Binary format, which will run natively on both Apple's PowerPC and Intel-based Macs. "With Microsoft Office 2008 for Mac, we focused on what our users want the most —compatibility with PCs, along with unique features for their Mac experience," Roz Ho, general manager for the Microsoft Macintosh Business Unit (Mac BU). She said customers have requested want quick access to tools and features within Office, and that those improvements can be seen in enhancements like Elements Gallery, which draws off of the company's new cross-platform graphics engine called Office Art 2.0. Ho said another important change is that Microsoft Office 2008 for Mac (like Office 2007 for Windows ) will be based in the Office Open XML Format —which was approved in December by the standards body ECMA International as an international standard. "Office for Mac users will benefit from the ability to access raw XML data within the file without having to parse the entire document, and ZIP-based container technology, allowing for easier recovery of corrupted documents and smaller file sizes," she said. For additional photos of Word 2008, please see the Office 2008 photo gallery published separately.